Hippie clothes. Bohemian clothing. 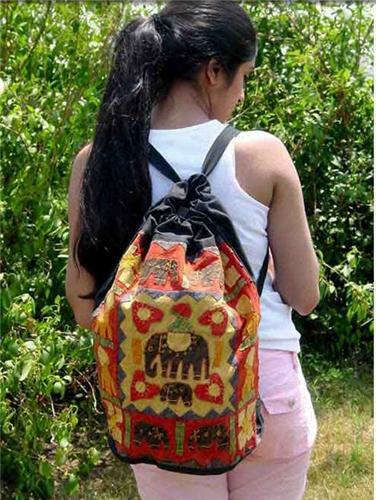 Handcrafted by artisans in India, these are beautiful one of a kind Indian applique backpacks. A very simple design, this backpack is essentially a cylindrical duffle bag but the handles are attached to the top and bottom so when you cinch it, you can wear it on your back. Because of the handmade nature of these backpacks, no two are exactly alike and therefor will differ from the picture a bit. The item you receive will NOT be the exact item in the picture. Circular gusset.